"Christmas at the Alamo" is a scene from one of the panels that will be on display in the Walker Education Center beginning Sept. 25. When many people think of Texas Independence, they "Remember the Alamo." "San Antonio and the Alamo played a critical role in the Texas Revolution. While the facts surrounding the siege of the Alamo continue to be debated, there is no doubt about what the battle has come to symbolize," according to The Alamo Web Site. "People worldwide continue to remember the Alamo as a heroic struggle against impossible odds—a place where men made the ultimate sacrifice for freedom. For this reason, the Alamo remains hallowed ground and the Shrine of Texas Liberty." The Sam Houston Memorial Museum will display "Alamo Images: Changing Perception of a Texas Experience," in the Katy and E. Don Walker, Sr., Education Center Gallery Sept. 25 through Oct. 26. The Alamo artifacts range from 150 illustrations drawn from historical documents, paintings, sketches, cartoons, comic books, and television and movie interpretations, brought in by Humanities Texas. The artifacts are "high quality facsimiles, that are both visual as well as informative," said Kathryn Tovo, director of programs and communications for Humanities Texas. "Humanities Texas is a state affiliate of the National Endowment for humanities," Tovo said, "Our non-profit organization supports and develops grant programs, traveling exhibits, and teacher awards. 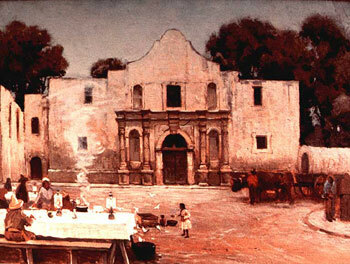 We have a total of 50 exhibits in traveling [right now] including Alamo Images." "The Alamo as a Spanish Mission," "The Struggle to Make it a Shrine" and the "Alamo Defenders and Fighters," are three of the 22 panel topics included by Humanities Texas in the exhibit. It also includes a brochure and the videos "The Death of Davy Crockett" and "Lone Star: The New Republic." "Our mission is to serve the whole state," Tovo said. "We are always happy for people to know about research and history." On Oct. 11, in recognition of Archaeology Awareness Month, Roger Moore, chief archaeologist of the San Jacinto Battlefield, will speak on the current excavations at the battlefield site and the on-going efforts to restore the site to its 1836 appearance. Moore's speech, "Peering Through the Fog of War: Conflict Archaeology at San Jacinto Battlefield," will be given from 7-9 p.m. at the Walker Education Center Auditorium. The Walker Education Center is open on Tuesday through Saturday, from 9 a.m. to 4:30 p.m. and Sunday from noon to 4:30 p.m.
For more information on the exhibit, call the Sam Houston Memorial Museum at 936.294.1832, and for more information on Humanities Texas, visit http://humanitiestexas.org/.